Coming from the north (e.g. Florence) on the A1 Autostrada, exit at Orvieto, follow the directions for Montefiascone, then Marta and Tuscania. From Rome or Fiumicino Airport, take the A12 that joins into the Via Aurelia. Leave this road at Montalto di Castro, follow directions to Tuscania. San Pietro. One of the most fascinating churches in Lazio, this basilica was begun in the 8th century and renovated in the 11th-12th centuries. 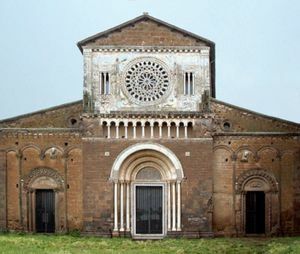 It is mainly interesting for its façade, which includes a superb rose window as well as some most un-Christian-like decorations, including three-headed carvings, know as trifrons. There are also representations of the Church and of Evil. Santa Maria Maggiore. This Romanesque Church also has some fanciful images on the façade. Walls. The city retains most of its medieval walls and some towers that protected the palaces of the important families. The Etruscan Museum. Contains sarcophagi and other objects from nearby tombs. Chiamamondo , Via Piansano, 7 ([email protected]). Internet point, international calls, money transfer, files scanning, files printing, faxes and copies.